At Platinum Recruitment, we firmly believe in giving back to those less fortunate. We proudly match the donations that our employees kindly donate each month. We then randomly select an employee to nominate their choice of charity to contribute to. Our winner this month was Alastair Crawford, one of our top hospitality recruiters from our Pubs & Bars Division. 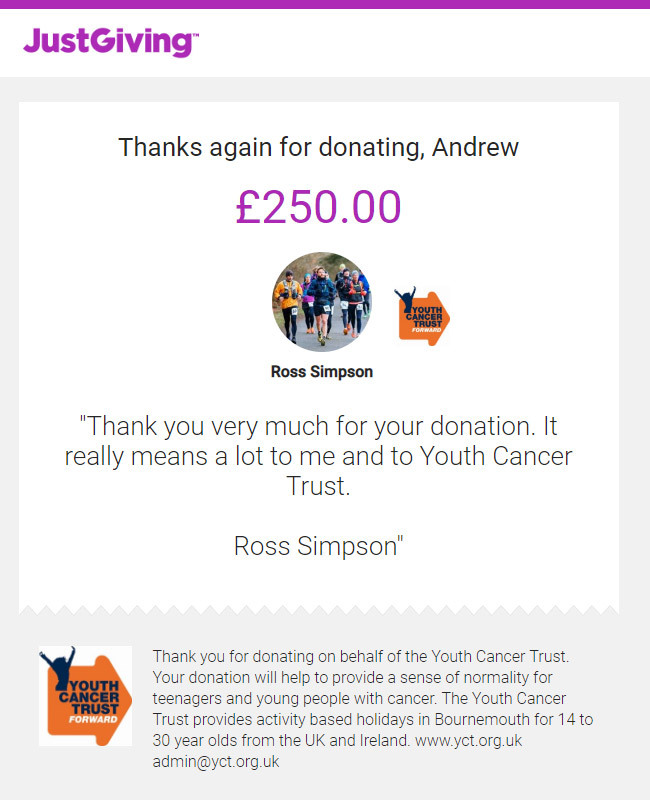 Alastair chose to support Ross Simpsons’ amazing fundraising feat for the Youth Cancer Trust and Platinum Recruitment donated £250 to his cause. Ross Simpson completed a huge 1,800 mile run from Canterbury to Palermo Cathedral on the Italian island of Sicily. This inspirational journey included running 65/70 marathons in 100 days over various environmental challenges, such mountains and volcanoes. So far, he has raised over £7,121 for the Youth Cancer Trust. The Youth Cancer trust is a Bournemouth based charity that provides free holidays and support for young people battling cancer and other malignant diseases. Youth Cancer Trust holidays are a fantastic way for young cancer patients to relax, meet others going through the same experience and build confidence. They offer a range of fun activities including horse-riding, sailing, water sports and more. There are many ways to support this wonderful charity, including hosting your own fundraising event, sponsorship or making a donation. If you are interested in learning more about Ross’s Little Run to Scilly or Youth Cancer Trust, please check out Ross’s Just Giving page or visit the Youth Cancer Trust Facebook or Instagram pages.